owner of the best (only) B&B in Amaryllis, Arkansas (pop. 5492) who’s flirting with 50, divorced (Travis Pembroke, had a wandering eye'), mother of Amaryllis PD Detective Bradley Pembroke, apple of her father Jake Kelley's eye, best friend of Mary Lynn Hargrove, the mayor's wife, and the only human creature tolerated by Abijah, the 18-pound orange tabby who stalks the family home-turned B&B. Penelope keeps her ear to the ground, her eyes open, and her battered heart in solitary confinement. Then one night, while having a beer and a Reuben at the seedy-though-popular Sit-n-Swill, she meets Tiny aka Sam who is about as much of a biker as she is a belly dancer. She insists on dabbling in danger and disaster despite Sam's best efforts to discourage her. The fireworks begin in Book 1, light up the skies in Books 2,3,4, and 5, and end in one spectacularly explosive display in Book 6. A police raid on the Sit-n-Swill, a devastating fire at her ex-husband's historic home, and a game of cat-and-mouse with Tiny aka Sam turns Penelope's placid life upside down. “They got to eat, too.” Jake sipped his beer. Her sandwich remained poised in mid-air as she watched the door fly open. It hit the jukebox and Glen Campbell’s Rhinestone Cowboy skipped two measures. Four leather-clad bikers strode in, flexing their tattooed knuckles in greeting—or threat. “Maybe we ought to leave,” Penelope whispered. “Not ‘til I finish my Reuben. They can’t get drunk by then.” Jake took another bite and chewed slowly. None of them answered, just swept up the bottles and swiveled to face the room. The man on the far end fixed his gaze on Penelope. Realizing she’d been staring, she dropped her eyes and nibbled her sandwich, but her appetite had disappeared. 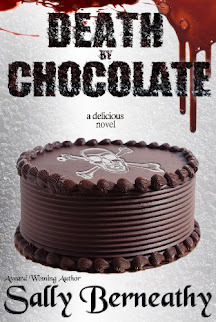 A sudden strong odor of sweat made her aware the biker had left the bar to stand beside her. She kept her eyes down. “Evenin’,” she heard Jake say. Penelope looked up at her father. Was there a warning in his words? She wrinkled her nose at the odor and turned her face away when she noticed he wasn’t wearing a t-shirt under his leather vest. “She’s shy,” Jake said. Penelope could hear the sarcasm in his voice, but it appeared lost on her erstwhile admirer. Penelope tried without success to pull away, but his fingers dug into her flesh. “You’re hurting me,” she said. “Pretty-please,” she said with ice surrounding each word. “I’m not hungry,” she said. 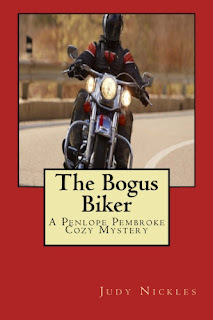 Penelope complied and tried to stand up, but her backside hit the chair again, courtesy of the biker’s grip. “I want to go,” she said. “She wants to go,” the man parroted. Something flickered in the man’s eyes. His fingers flew open, releasing Penelope’s arm, and he stood up so quickly the chair overturned. She watched his eyes dart around the room and wondered what—or who—he was looking for. From the jukebox, Kenny Rogers pleaded with someone not to take their guns to town. Almost as if on cue, a single gunshot shattered the air and sent bodies scrambling for cover.